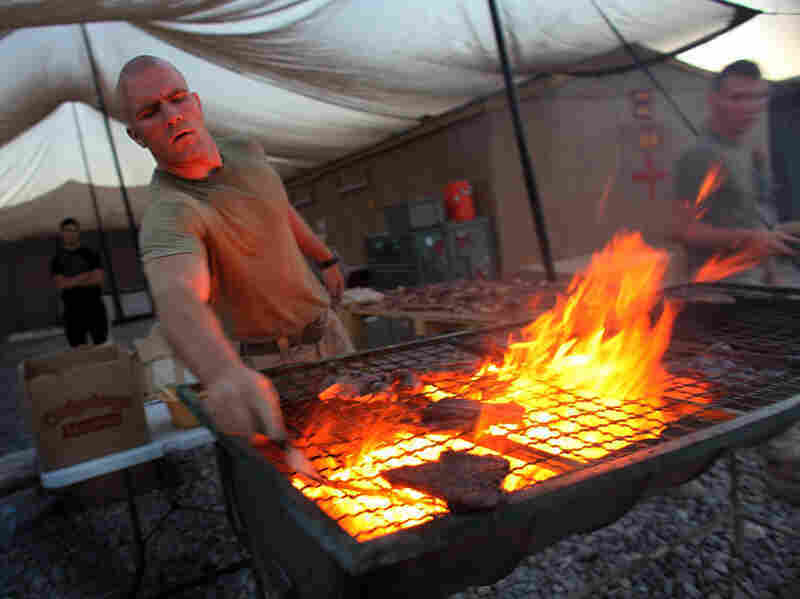 Meat, Fire And The Evolution Of Man : Shots - Health News Once humans started eating meat and cooking it, we got more calories and energy from our food and didn't need to eat constantly. That allowed our brains to grow and focus on other things. You can't have a big belly and a big brain at the same time. That's just the way it is, says anthropologist Leslie Aiello, who runs a foundation that funds research in evolution called Wenner-Gren. Now, we're not saying that obesity is somehow linked with intelligence. Rather, Aiello's rule explains how humans evolved -- how and why we went from small-brained, raw-food eating primates to carnivorous, large-brained cooks. In the latest story from our series "The Human Edge," Aiello and others explain that eating nothing but raw vegetable matter, as most apes and most probably our earliest ancestors did, means you've got to have a really big gut. Think cow-like. That's because there aren't a lot of calories in leaves, berries, nuts, and tubers. So you have to eat constantly and pack as much into your gut as you can. The gut was an energy-hog, and digestion consumed most of the energy our bodies produced. Then our ancestors discovered meat. Meat contains lots of calories in a small package. More meat allowed our guts to shrink. Digestion wasn't so labor-intensive, so to speak. So where did the body's extra energy go? Into building a bigger brain! That's the theory, anyway. More meat also changed out teeth, as well as our jaw. We no longer need big grain-grinding chompers. With bigger brains, we invented tools that cut up our food for us. And then, when some clever cave-dweller discovered fire, cooking continued to alter our bodies. That's the view of Richard Wrangham, a Harvard anthropologist, who explains that cooking food -- meat or otherwise -- gives us more calories and energy from our food. Although now we may have gone too far with the whole meat thing. But belly up and give a listen to our story on "guts, teeth and cooking." And as the Neanderthals used to say around the campfire, Bon Appetit!